Not many Scrabble players realize just how important eight letter words are in the game. This is probably because each player has seven letters on their rack, and so they think of a bonus as one where they use up all seven of their letters. This is true, of course, but if you weave those seven letters around an existing letter on the board, then your bingo is an eight letter word. Even less well-known, is the fact that eight letter bonus plays are actually playable more frequently than sevens! In fact, they turn up about 30% more often. 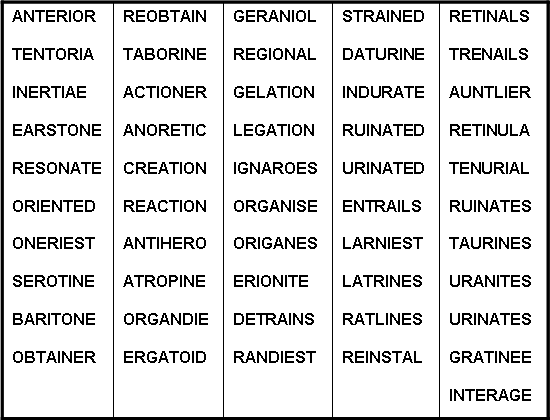 All the words you see in this list can be found in Collins Official Scrabble Dictionary, which is the official Scrabble dictionary endorsed by the World English Scrabble Players Association (WESPA). This is not, however, the official dictionary used in North American Scrabble — here you use the Official Scrabble Players Dictionary. Now you'll probably notice that my list is not in alphabetical order. That's because I've put the words in order of probability, with the most likely words appearing first. 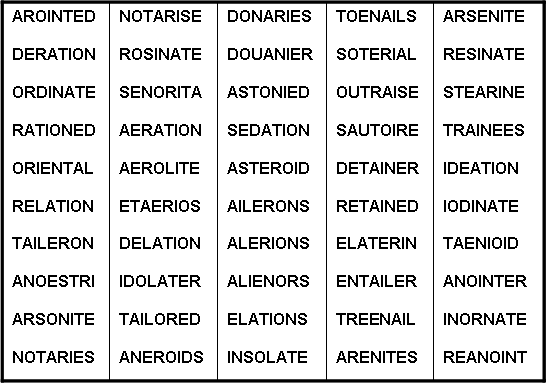 And since words made up of the same set of letters have exactly the same probability of being drawn from the tile bag, this also means that anagrams, like GRATINEE and INTERAGE, appear together in the list. The good news is, I've now created a completely up-to-date list, not only of the top 100 eight letter words, but of the top 500 eight letter words! I've formatted them all in a really easy-to-study way that readers are loving. What do all these eight letter words mean? 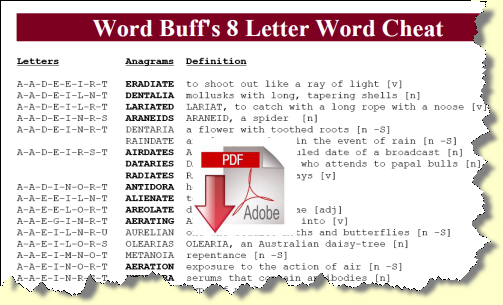 Finally, just in case you were wondering whether any of these weird looking eight letter words are genuine, here is a brief definition for every eight letter word appearing on this page. Also, as I promised at the start, I've highlighted in BLUE the words that are not valid Scrabble words in North America.